At last your sports science and medical data management system. Fully customisable, fully loaded for you. Collect data across an endless, fully customisable range of disciplines Create and schedule your own injury treatments, then fine-tune your teamwork by assigning separate work-teams to each injury thus optimising both treatment and rehab. Store all your data in just one easy-to-access place Access easily and quickly from any device, anywhere at any time. Forget about languages or time zones, establish your very own internal communication channels, use our chat or just automatically share any event with any other user of your choice. With Rugby System Pro knowledge and expertise will flow to all the staff. 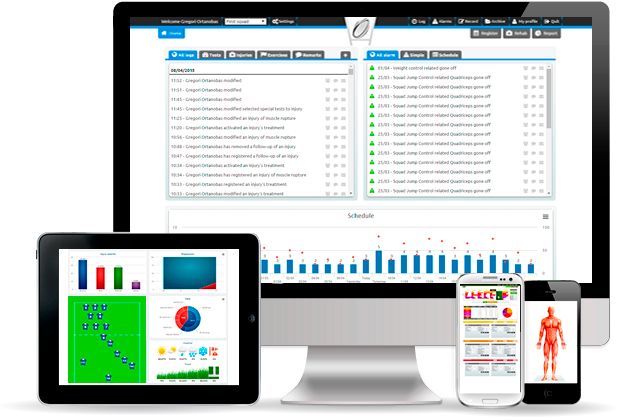 Real-time access to all facets of complete application software Rugby System Pro is a full online rugby medical data management solution. Access it online through any web browser or any device including PC, Mac, iPhone/iPad, Blackberry playbook and all windows and Android devices. Powerful cloud hosting options mean your data is always available and secure.